The Showers of April … Have Brought Opportunities and Gifts in May! 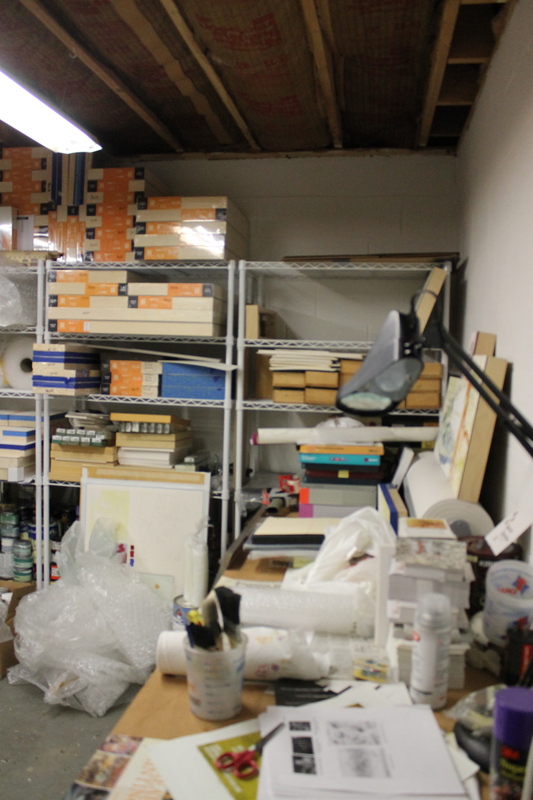 My last post talked about how the winter and early spring had been rough … with all the demolition in the studio and the storage areas. Well, my tiresome kvetching … and the demolition process are done and the major reconstruction is almost over too! When the space is all new and fresh, I’ll gleefully post those images. Now, as April has wrapped up and the rains have brought us into May, I seem to have a lighter heart and and a less frenzied head. Frankly, it didn’t hurt that I’ve been having some fun and some good luck as well. Many of you know that I really love to go sketch outside. 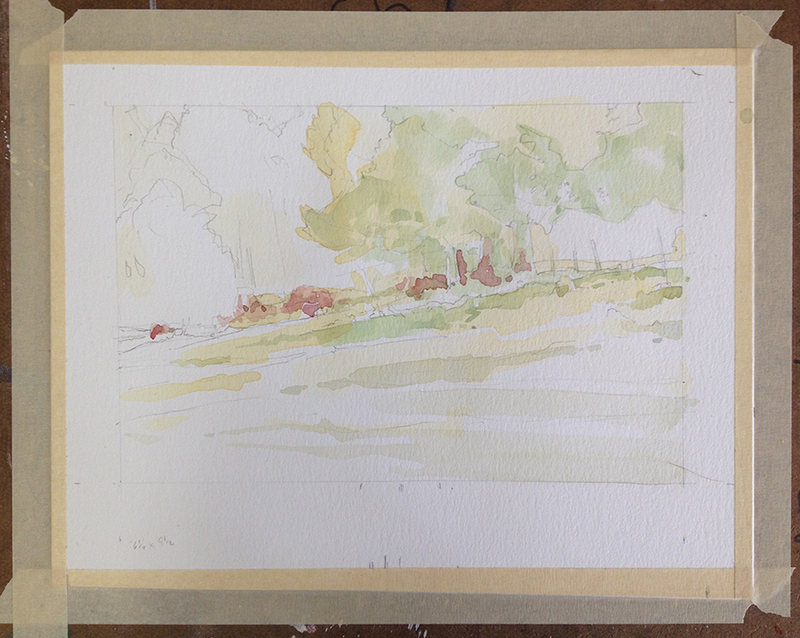 Working with pencil, inks, watercolor, or gouache … I make lots of small pieces. It always feel so good to get lost in that work. 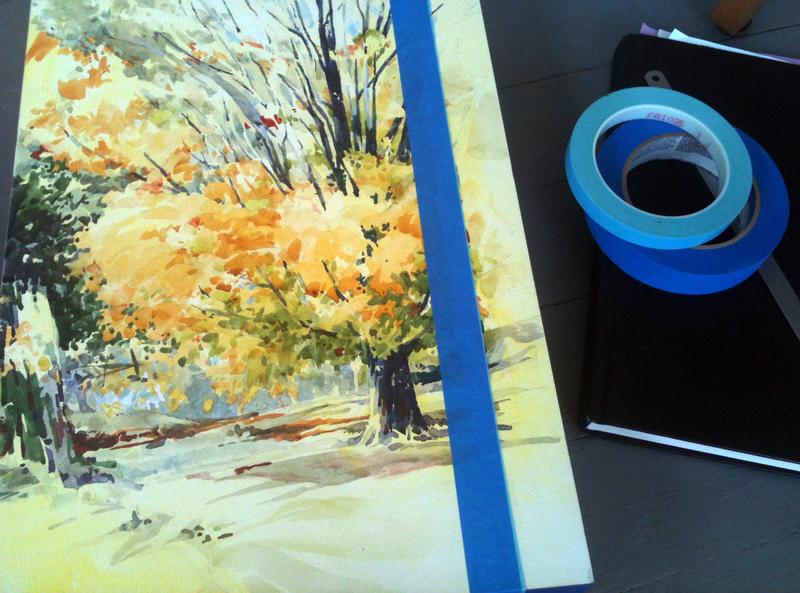 Sometimes I will even whip out a panel or a larger sheet of paper and complete a whole painting on the spot. Working that way reminds me of my Saturday forays into downtown Wichita (yes, I lived in Kansas for a few years) to draw the stately brownstones … or of the watercolor classes that I took back at Valdosta State. 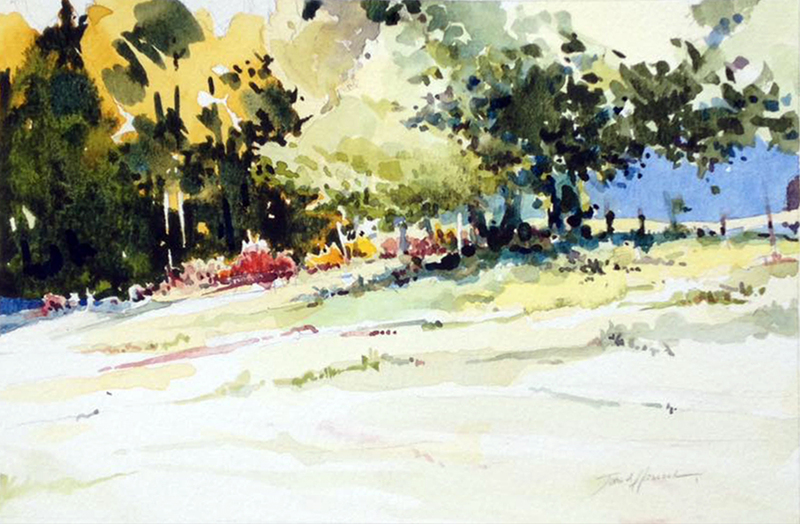 I used the “plein-air” process for ten years as my primary painting strategy. 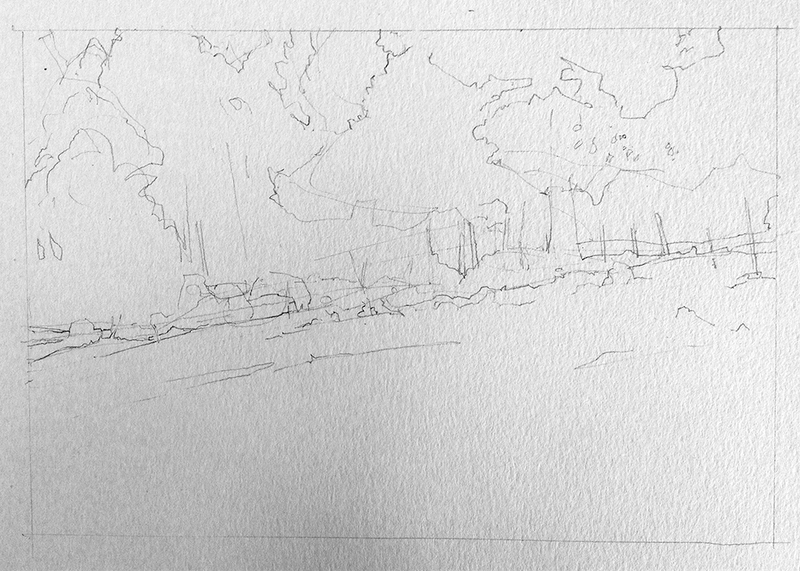 And while today I mostly use it to help prep for studio pieces, I still get a kick out of making a good small sketch. 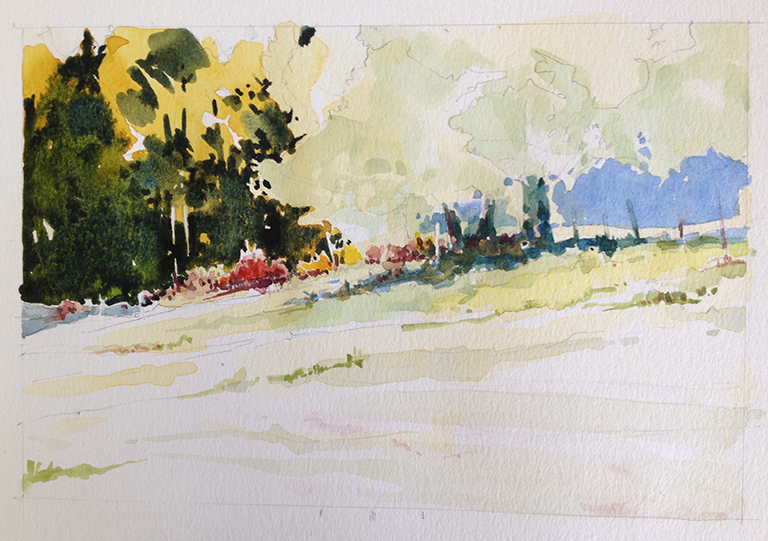 Well, I participated in a couple of Plein-Air Paint Outs and Quick Draw events in our region recently. 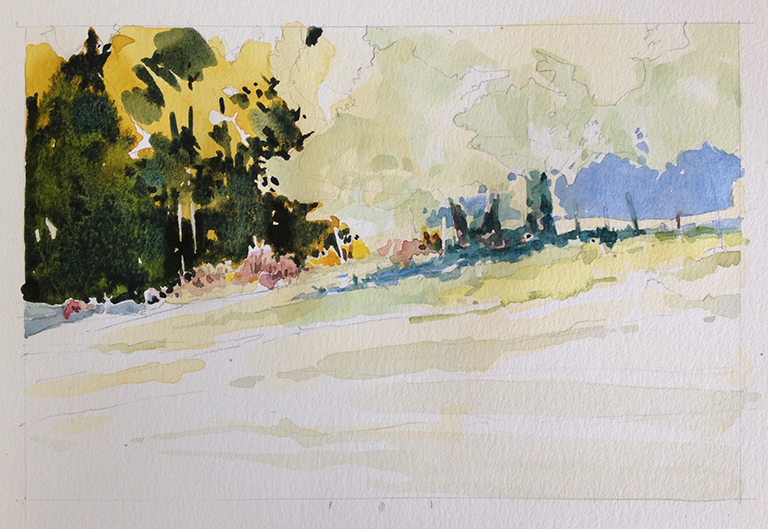 Painting while dodging the frequent rain showers … and meeting and talking with new colleagues was a joy. The energy and camaraderie were really nice too. Of course it didn’t feel bad for the old ego to hear a few nice comments and get a little recognition from one’s compatriots after a long day out making art! As I said above, I use these types of sketches, studies, and small plain air works as references for my studio pieces. I am exhibiting some of those more involved studio works this coming month too. The exhibit is happening at The Gray Gallery, a fairly new venue in Winchester, VA. It is a two person exhibit, titled Structured Environments ( http://www.the-gray-gallery.com/exhibitions ) featuring Kung Chee Keong’s and my work. I have about a dozen pieces in the show, all from my Shaped Landscape series. 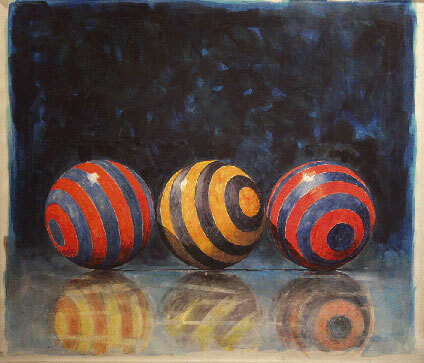 The newest piece … finished just a few days ago … is actually a reworked triptych that I started over four years ago. In my eyes, it has always been only “almost” right since I stopped working on it. I recently had a few ideas for how to improve the design and to make it a lot better. I am pleased with the new version and I am really happy to see what others think. I like Keong’s images a lot too, they have lots of movement and energy. It is an interesting pairing. These bodies of work will likely create a neat visual dialogue for the viewers; they do for me. 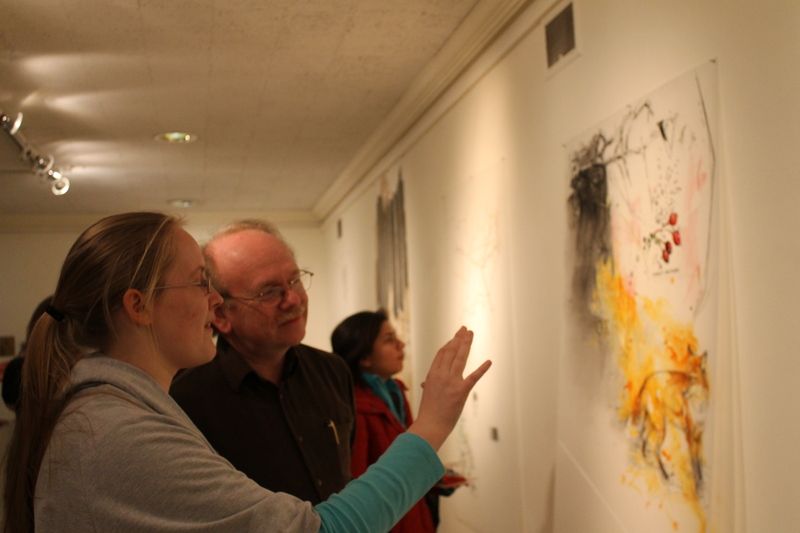 The exhibit is now open and the reception is on Friday, May 6th. The show will run through May 28th. 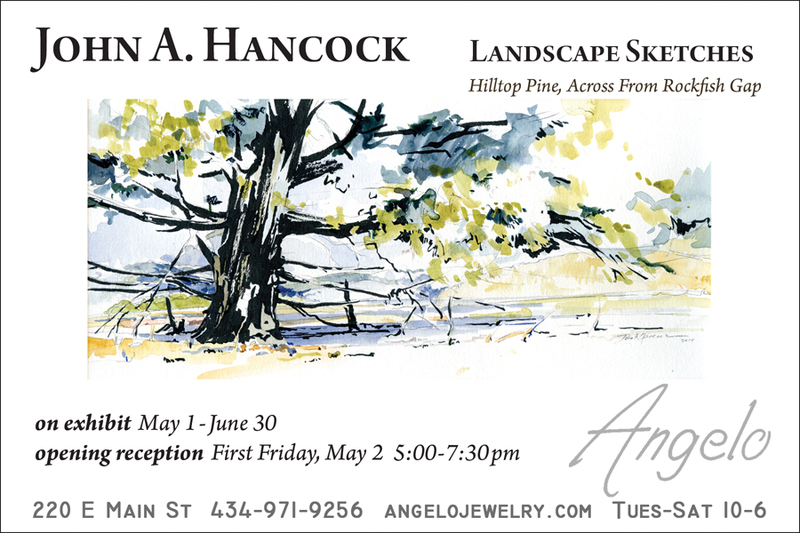 If you are in the northern Shenandoah Valley this month, please do stop by the Gray Gallery and take a look. The gallery is on Cameron Street in Winchester’s Old Town district … a beautiful and very walkable downtown. Enjoy the art and, if you have time, maybe grab a bite to eat while you are there. Make it a day! As you see, a few weeks have gone by and life turned another corner. This corner, this turn, has lots of spring showers, thunderstorms, and even downpours to dodge … or to dance in. Whichever approach to dealing with the rain, it is a hopeful season. More later! I am always looking out for artwork, especially watercolors and other works on paper, that are interesting; something intriguing or perhaps even truly compelling. When I was full-time college artist-educator, I would always be on the lookout for any/every type of work to share with my students. Now, some of you may know that, besides drawing, I work quite a bit with various aqueous media and most often in/or with watercolor. 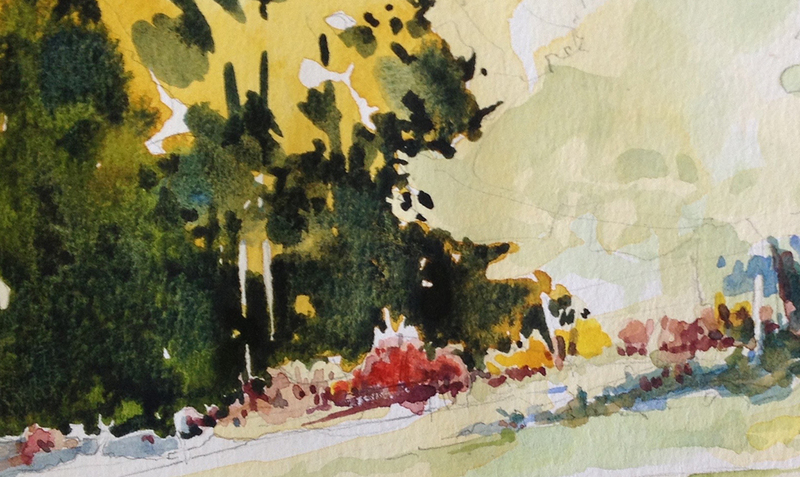 So it probably wouldn’t surprise you that finding exciting, new work done in watercolor is a quest of mine. It has been for many years. 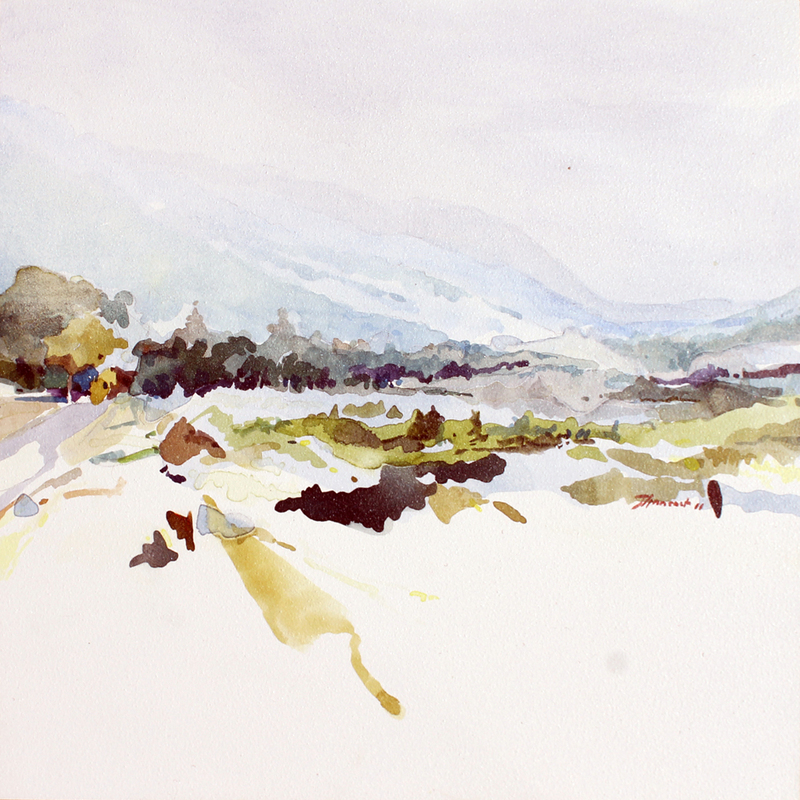 There are lots of fine watercolorists out there … but there is too much repetition and far too much acceptance of staid approaches to the medium. Please don’t get me wrong, using a a traditional figurative approach is fine … and I LOVE beautifully made images created that way … just as long as there is something new, fresh, or personal about the work. 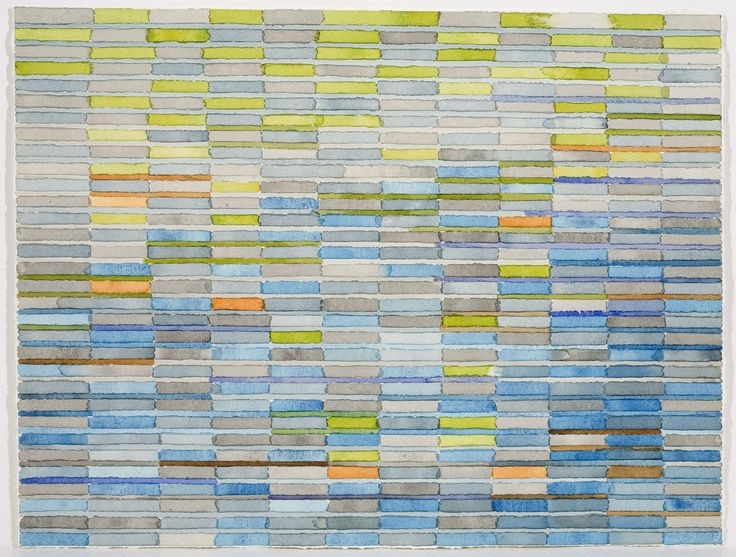 Conversely, I grow quite bored with a lot that I am seeing when looking at so many of the contemporary artists working in the watercolor medium. This is sad because watercolor has often been on a cutting edge, been a medium for artists to experiment and play with new ideas. Just think of Kandinsky, O’Keefe, etc. It has also been a medium to use for long term exploration of visions and concepts. We have no further to look than such diverse artists like Klee, Klimt, Demuth, Marin, Burchfield or the Wyeths. 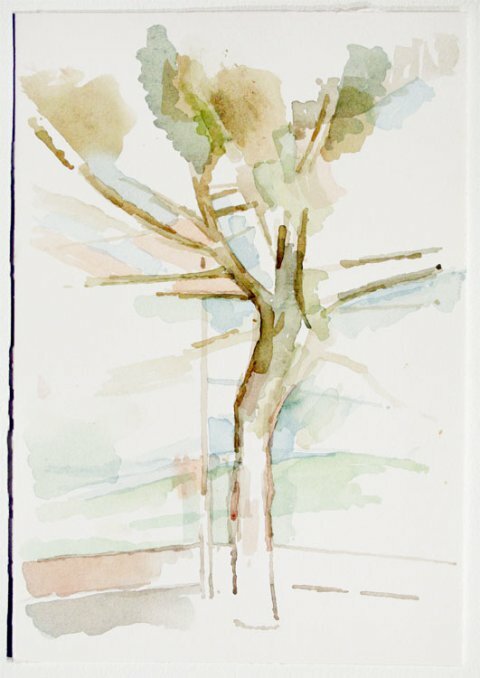 I want to find new images made with watercolor, new ways of working, or new examples of the absolute mastery of combining technique, design, and content using watercolor. New art! Please! 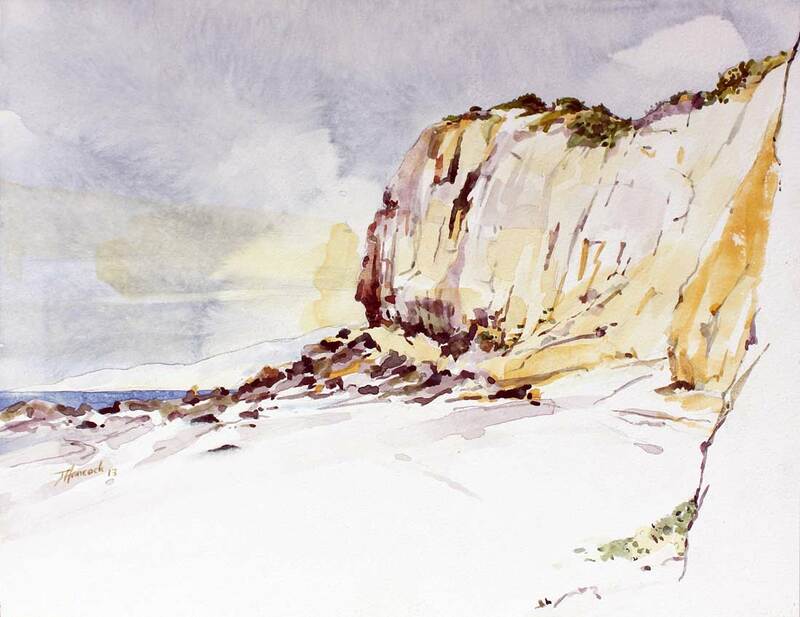 With that in mind … there are five artists whose work in watercolor has caught or has recaptured my attention; Artin, Forge, Gibson, Nickson, and Sinclair. Wendy Artin’s work is a handsome modernization of traditional media combined with a very classically based content. An artist who is working now, Artin has begun to gain some critical and popular attention. I think that I first came across her images a year or more ago in either an issue of Drawing or Watercolour. Since I still teach a few college drawing courses each year … I was excited to share her work with my students. 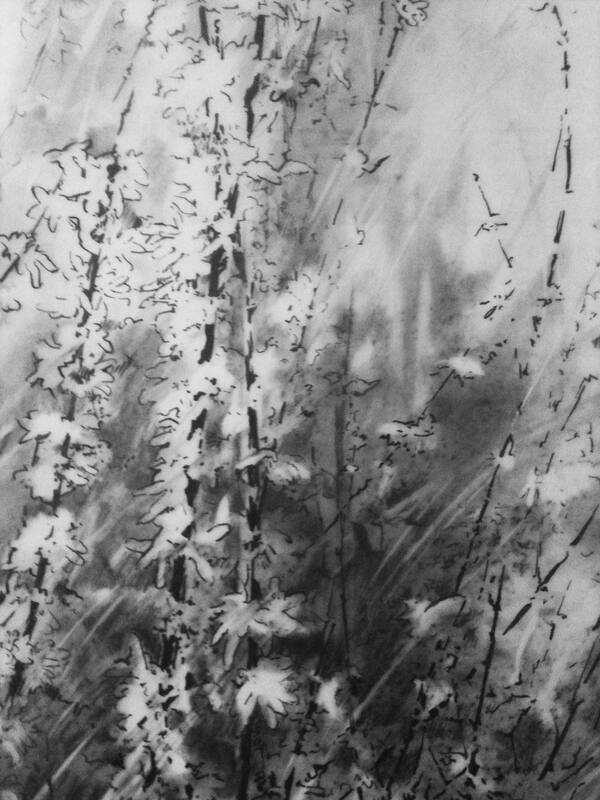 But for me personally, it was her nearly monochromatic watercolor wash drawings that intrigue! Some of Artin’s pieces have the fluidity of a great Tiepolo; others have hints of the moodiness in a wash drawing by the French artist who also worked in Italy … Claude Lorraine. 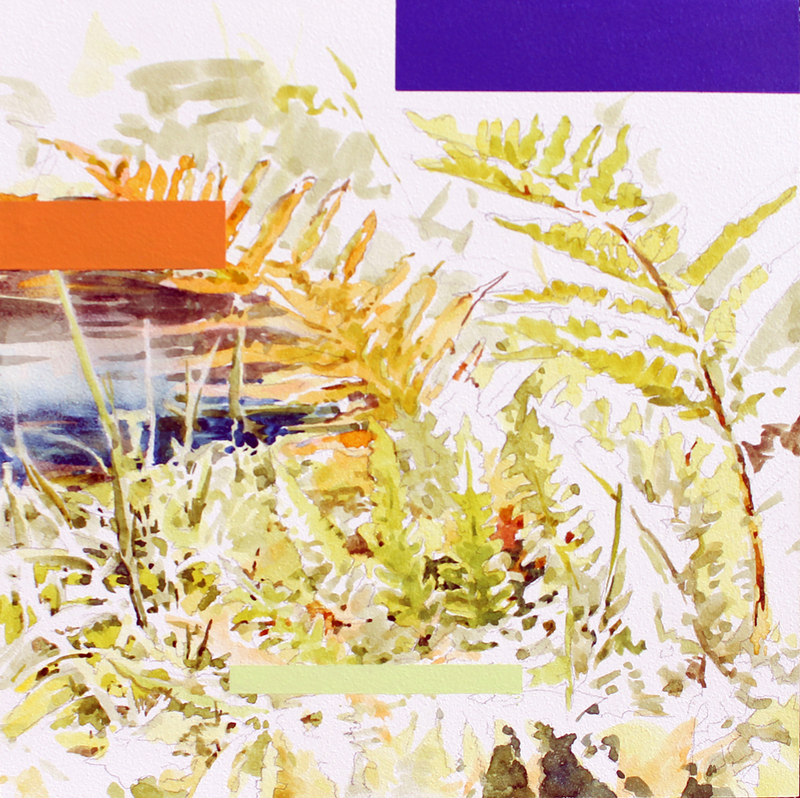 She finds a balance between playfulness and a sense of “veritas” in her work; while combining “wet-into-wet” areas, dry brush techniques and judiciously reserved white/negative spaces with apparent ease. The renewed and refreshed classicism of her work … not to mention the gutsy design and mimetic rigor of works like Parasol Pine Panorama (below), can take my breath away. Andrew Forge was born and studied art in England where he taught at the Slade School of Art, Goldsmiths College, and the University of Reading. 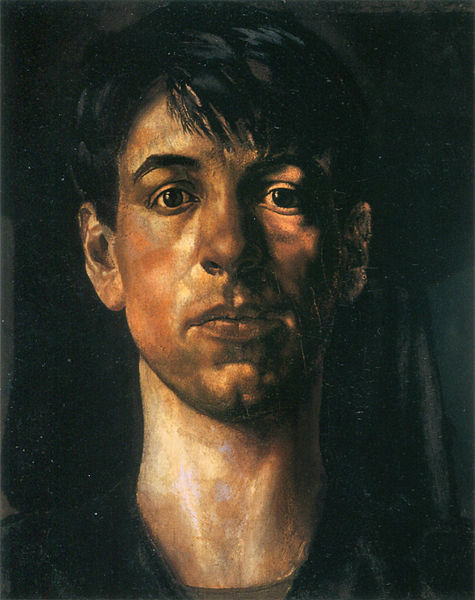 He emigrated to the US and taught at Cooper Union, New York Studio School, and taught painting at, and served as Dean of, the School of Art at Yale before he died in 2002. His work as an educator and as an art writer/art critic was well grounded in his painting. Forge seems to have worked his way visually and intellectually through the various styles of modernism. One thing that I see in his paintings is an early encounter with Cezanne’s way of visually processing an image into an arrangement of color patches on a surface. And, in his later work, Forge also seems to have followed that manner and concluded with a further joyful abstraction. His work of the 70-90s has all the delicate spareness one might expect from an artist steeped in classical clarity, nuanced perception, and a humane visual playfulness. I came across John Gibson’s work at least 20, or maybe 25+ years ago. I saw it … and it printed in publications. I could surely see that it was good work, bold and confident. But after looking at a number of examples, it frankly appeared to be to much the same thing over and over. I grew jaded and, yes, bored. Mea Maxima Culpa! You see, Gibson works on a basically simple premise … creating believable an image of 3-d sphere(s) on a totally 2-d surface. This is the old (Renaissance “old”) task of visually rendering space and form. 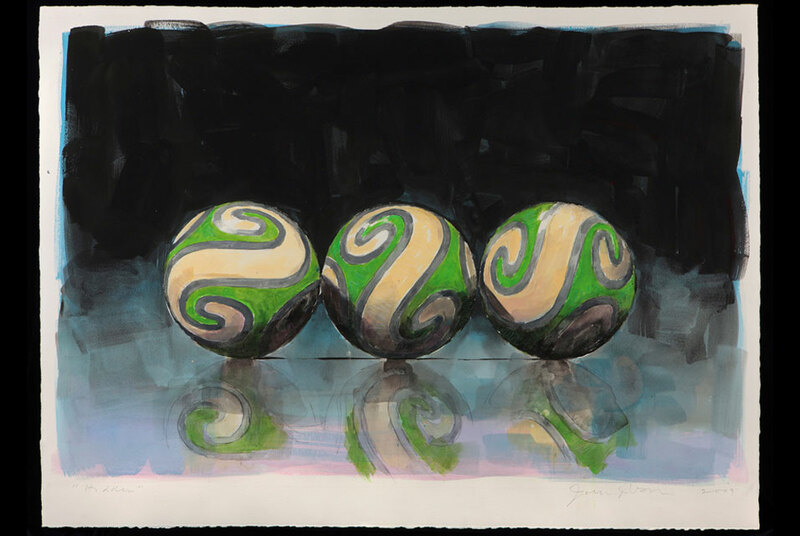 And Gibson does throw in a visual treat that some might find to be a bit of visual irony … almost all of the spheres he depicts are decorated with patterns. As I said, I got it; I grew bored. I moved on. Yes, I occasionally used one of his images to help me teach form in a drawing, studio painting, or watercolor class, but that was about it. Frankly, without running across it again and again, I didn’t have much time to really be ensnared by its charms. And there are charms in this work. Recently however, something drew me back to look at his work some more. After 30 years are so … I felt a desire to re-examine his spheres. Maybe it is a desire to understand his obsession. Or to just be charmed! What ever it was, I am glad I did. As I let the obvious similarities slide past, I could begin to see just how sumptuous his color was … how rich and yet carefully he used color to assist in the rendering of BOTH rounded forms and the “vapor” of depth and space. These are not easy, facile works but they are quite confidently put together. I see no design magic here; rather there is a solid, logical construction to these images. The color isn’t flashy either, instead it is finely balanced and so deliciously worked into the substance of the painting. Well, those are three of the artists whose work in watercolor I am finding exciting or challenging right now. My hope is that you saw something new or interesting too. I will finish up writing about the other two (Nickson and Sinclair) very shortly and post an addendum quite soon. Right now though, the studio is calling !!! Two shows Delivered … resetting the studio for work! Excited and exhausted; to say the very least. During January I installed two large exhibitions in two weeks. The installations went well. I was really quite happy with getting to see the works up on the walls together! One exhibit had an opening reception that was very well attended, I got lots of questions and discussion, and folks seemed to have a splendid time. So I walked away with good feelings … relieved, happy and even a little euphoric. 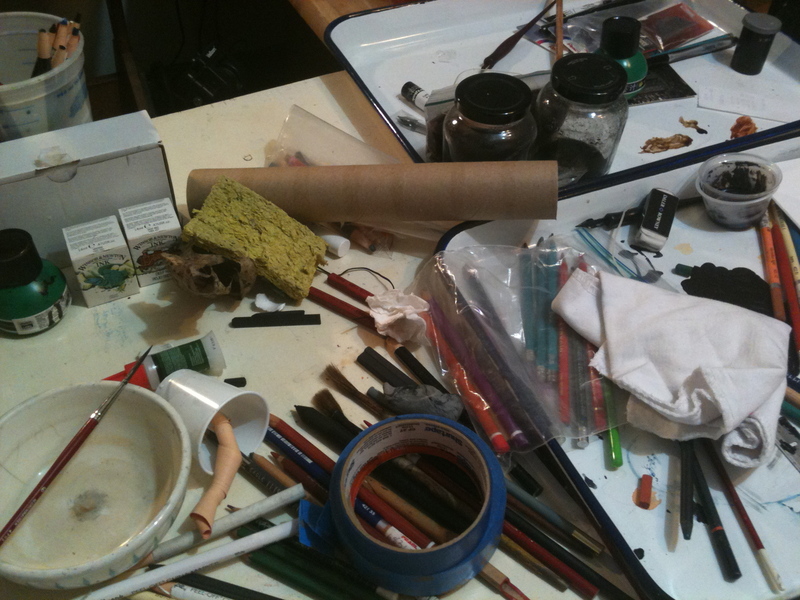 To be honest though, when that kind of scheduling happens, my studio and my life tend to get pretty … no … really messy. As the two shows loomed on the horizon, I began to focus more and more on the logistics of finishing, prepping and packaging for transport. At the same time I was continuing to make the last few works for each show. This left me a bit crazed and frenzied at times. I was switching back and forth between production mode and thinking about logistics. I wasn’t putting supplies and equipment back in place at the end of each session. The studio got way out of hand! Normally, once a show is up, I start to wind down. When some of the exultation and weariness begins to abate, it is usually time for that reflection to begin … to take stock of where my work is/is going, to decide if I need to shift directions, alter my course, or adjust my strategies. That is usually a very good thing for me but I have to admit that more than once I have let myself fall into some type of post-show stupor and have had a hard time getting back to a steady working routine. This time, I really couldn’t stop … the other show had to get out the door in less than a week! Now the second show in Pennsylvania is up … and I am noticing an interesting turn of events. Even while working on and installing the Pa. show, the heightened analysis process that I use after completing milestones/projects had begun. So, instead of collecting my thoughts while I was puttering through the studio doing some straightening up … I was already in full reflection mode when I walked back into the studio upon returning. All the drawing tables, supply tables and chairs are full of stuff! The practical tasks seemed, this time, to jump into sharp focus and to hand. 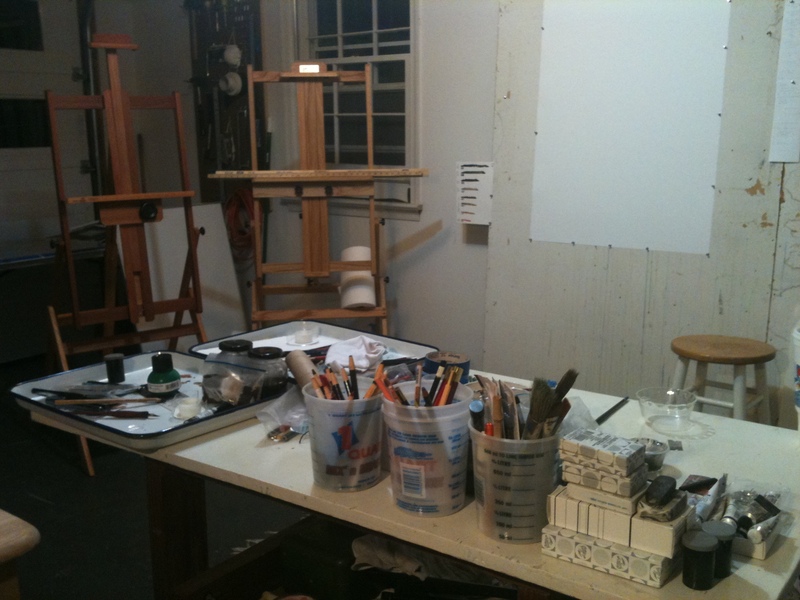 First, the studio needed re-organizing and cleaning. 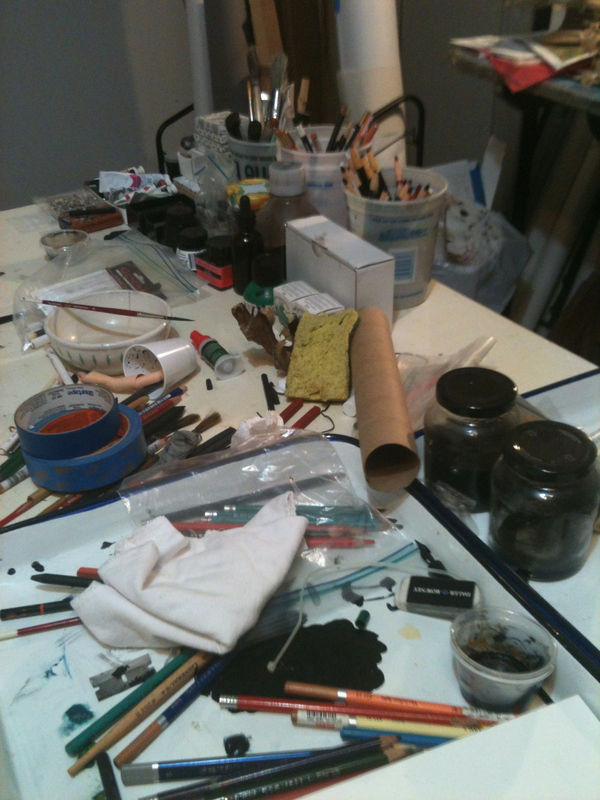 Working in mixed media, if everything isn’t put away after a few sessions, it can leave the materials in a disheveled heap. It was a bit of real jumble as you can see here! There were transportation and packing materials to properly store. 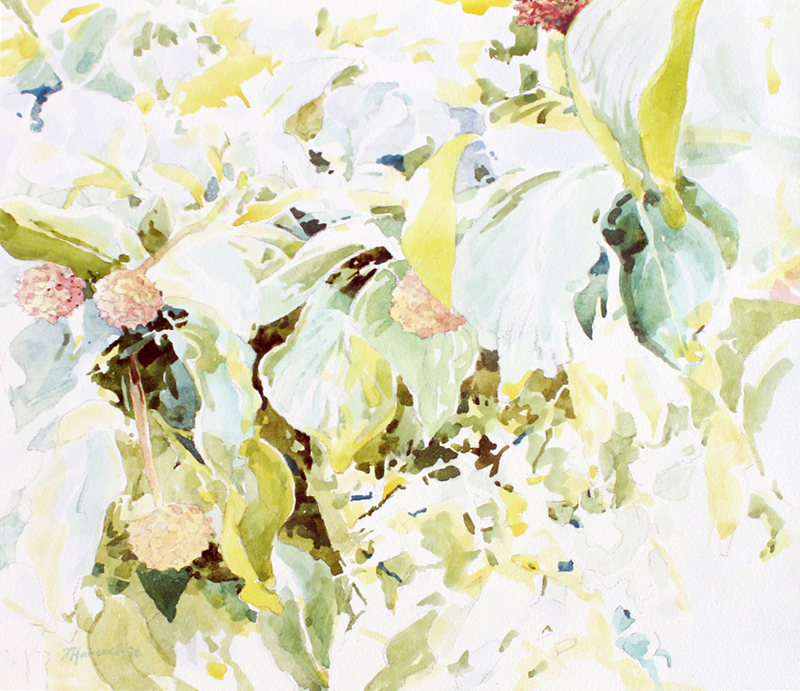 And I have to make some sense, some order out of all the resource images, sketches and photos … as well as pieces of plants, dried seedpods, maps, and other studio materials to file away or re-evaluate for use soon. (I am not sure I have ever really gotten a good filing and storage system for doing these items!) I usually look about and see if there is something that I think that I need from old resources or need to go get/create at this point. While I am getting things in order … it is good time to do a materials inventory too. Whether there is any income from these shows or not I’ll need replenish my stock, to order some fresh supplies and repair/replace any damaged or broken equipment. So as tools, supplies, resource images/objects, are sorted out, the periodic cleaning MUST take on a high priority! I expect that it may need an even more intensive version this time ‘round. I would call it a “spring cleaning” but we are still in the depth of winter. As I said before, I usually build to all these tasks as I reflect on my direction. This time, the practical/logistical tasks are happening at a quickened pace. It sort of reminds me of my German colleague and friend Brigitte Weyer, who moved into a new town, home, and studio … and was painting within two or three days. Even with some of the boxes still packed. It seems as though I am resetting for new work already! The studio is getting back to a workable state! 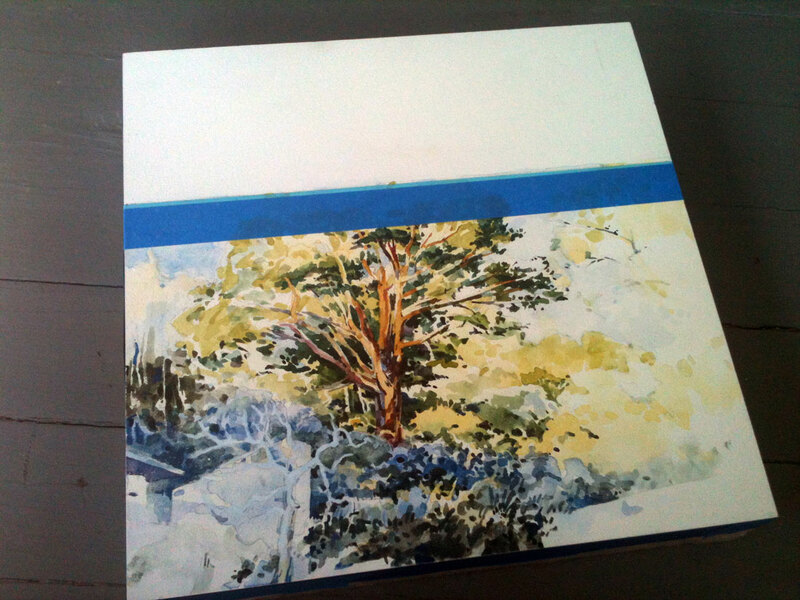 I am also feeling the need to be working on my aqueous media painting … the works on panel and paper. 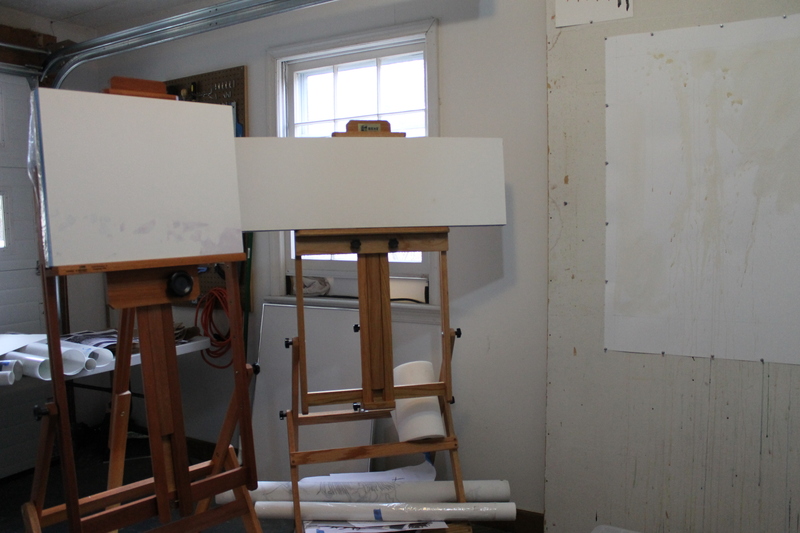 I have a major multi panel painting in the works and three or four smaller single panel pieces roughed in. I need to start applying some color layers. That feels exciting just thinking about it! Look closely, I have already started laying in the first color passages! 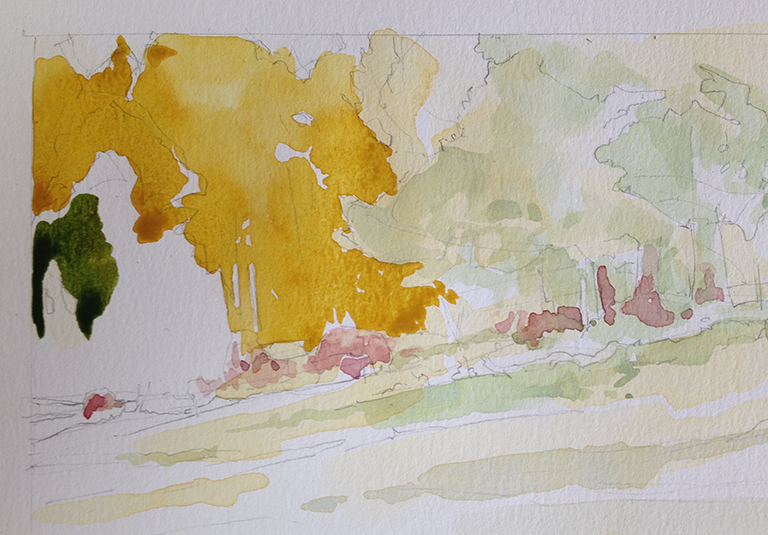 There are some large watercolors on paper in the pipeline too. 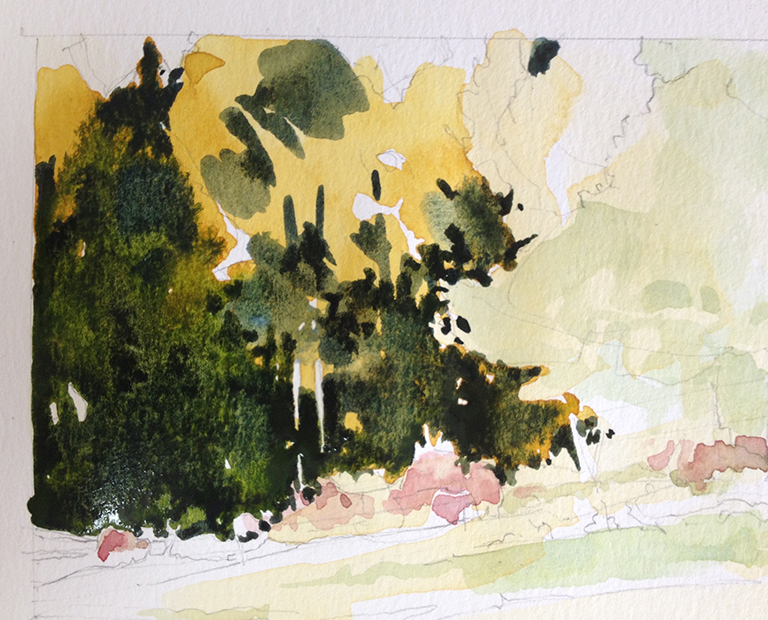 I am also really chomping at the bit, anxious to get outside (even in spite of this much colder than average winter) to begin working on new small sketches and studies. Once I have really gotten all these moving … I will, as is my praxis, let the work lead the way; letting each of these strands of working weave themselves into an organic and fairly seamless whole. There is a good lesson to take-away from this experience. I have known for many years that I need reflection time … but I do want to avoid the post show let-down and stupor induced paralysis it can bring with it. My scheduling of these two exhibits right on top of each got really messy. You could ask my wife. Perhaps though, it taught me again to NOT completely stop … to not let rethinking and re-ordering become a false reverie. I have new works up and running. The studio is coming along. And we are planning a few trips (combining art and personal fun) and a vacation too. Some items below this dotted line may be an advert inserted by the good folk at WordPress to help pay for the costs of running a site that publishes this and thousands of other blogs. 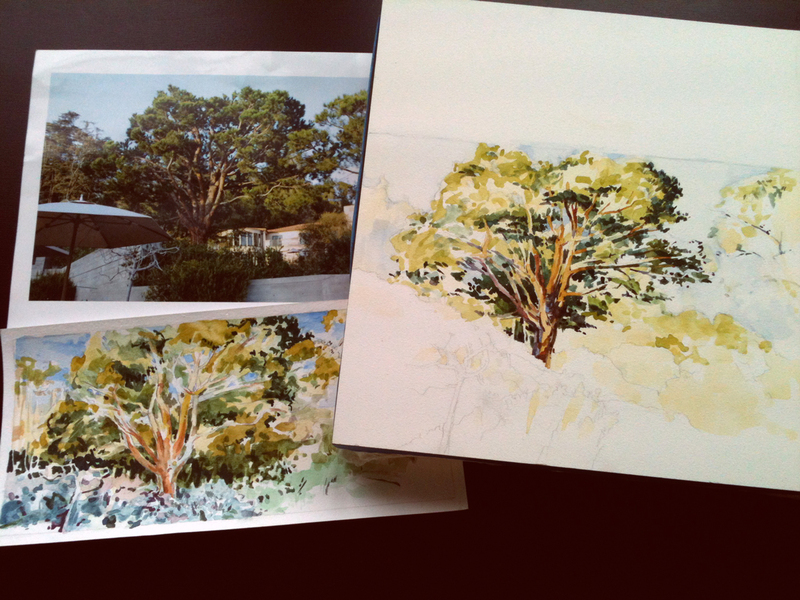 Going from study to “finished piece” … and back again! 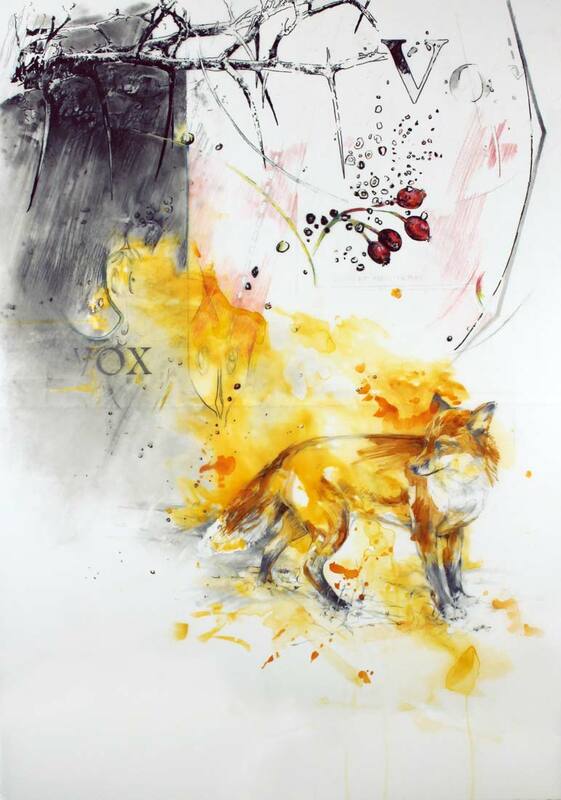 Earlier this week I posted about a work (the working title was “Vixen”) that I finished a bit before the end of 2013. That piece is part of my on-going Natural-Family-History series; a group of large to installation sized mixed media draws that incorporate and align images from nature/natural history and from my family history as well. Most of the time I work up the constituent parts of the drawing’s content pretty fully; If for no other reason, it becomes necessary to do so because of the size of these works. Most of the time though, I don’t plan the entire composition. It isn’t that I can’t. I certainly have worked that way in the past. I taught my students how and why it can be such a great practice. Instead, I have been using a modified, jazz influenced praxis. Utilizing a hybrid hand-digital sketching process for the parts of the drawing, I can then create digital enlargements. Then I work up multiple sizes of the visual elements. With these and projections, I can experiment and improvise … sliding the pieces around as if in a collage. Now, that has been the practice of late. 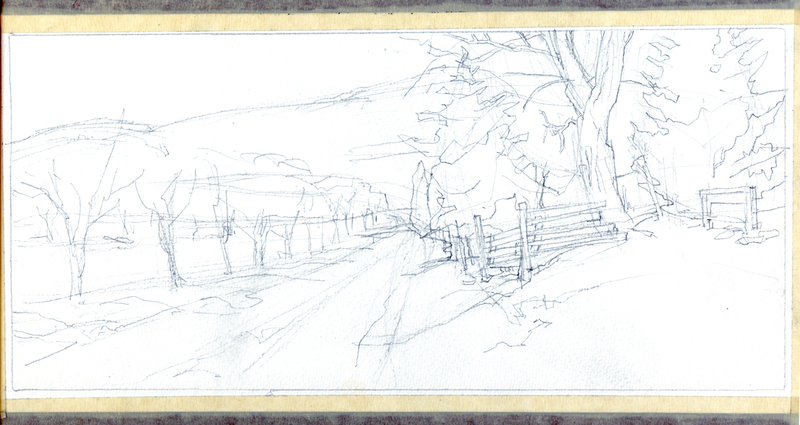 But ever-so-often I do back track to a more traditional way of working and produce some 1/4 to 1/2 scale studies. In fact, the mylar drawing, Voxis Vulpis actually began as just such a study on paper. I thought it might be interesting to look at how I tried to work up the image/idea. And how the study went so very badly … and made a come back … as a very different work! 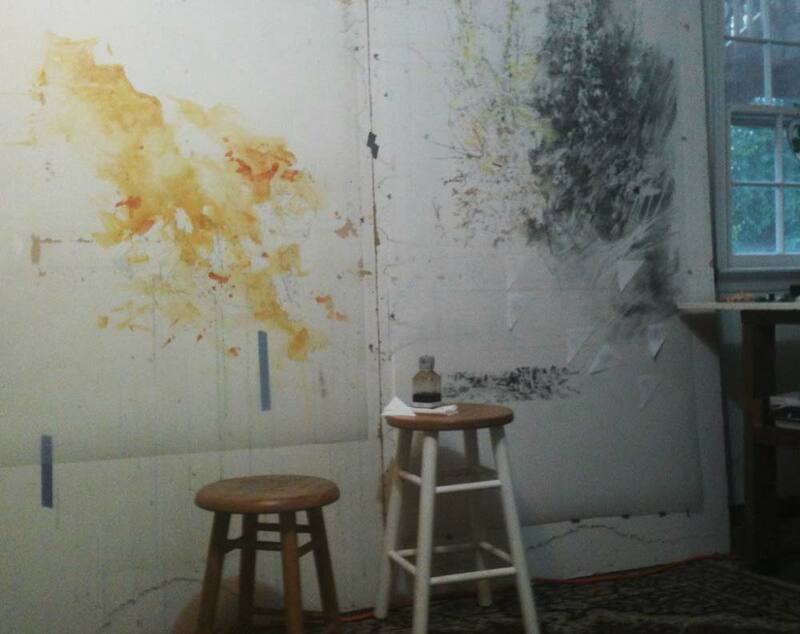 To the left is a view of the studio with the study at an early stage of the process. 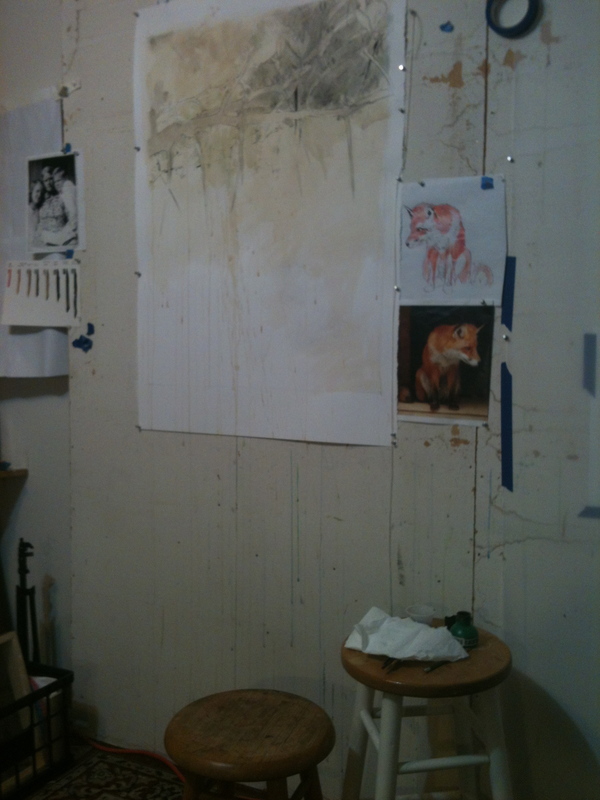 Note the visual resource photo and the red sketch of a seated fox pinned to the wall. 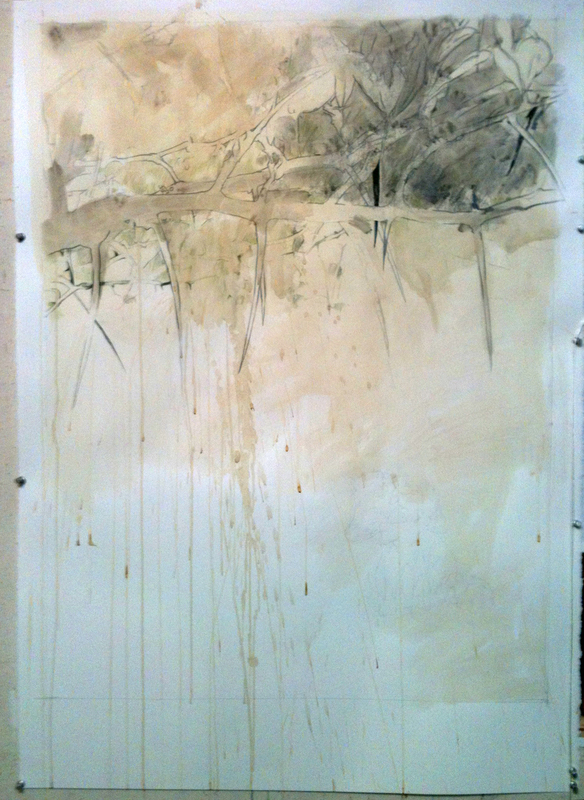 The messy, playful, nearly random staining underlayer is visible … as is basic drawing of the Hawthorn branches, leaves and thorns that had been begun for the top section. If you look carefully in the lower right hand area of the study, you can see remnants of the drawing of the seated fox planned for this section of the of the composition. The B&W image to the right may help you see the erased head, snout, and nose of the fox just a bit better. Upon reflection, I made a pretty massive change in the direction of the image. I thought the scale to be all wrong and I was also disenchanted with that pose. I even began to dislike the drooped head posture for this piece. After erasing the head and body of the fox, I planned to add a different version of the fox. As I made that decision, I also began working up the additional design elements on the larger mylar piece this study was the preparation piece. As I worked on the larger work, I made the decision on the version of the fox I wanted to use; one that was in a standing position with the body oriented towards the viewer’s right … but the head still looking left. I also altered the idea of the Hawthorn branches and thorns from being done in tonal dry media … into creating them with a rich black ink. At this point I abandoned the study. A bit later, as I was working on another large mylar piece, I looked across the studio and saw the unfinished study still up on a wall mounted drawing board. Whether by serendipity or some internal decision making process that I was not aware of, I decided to give that sheet of paper another go. 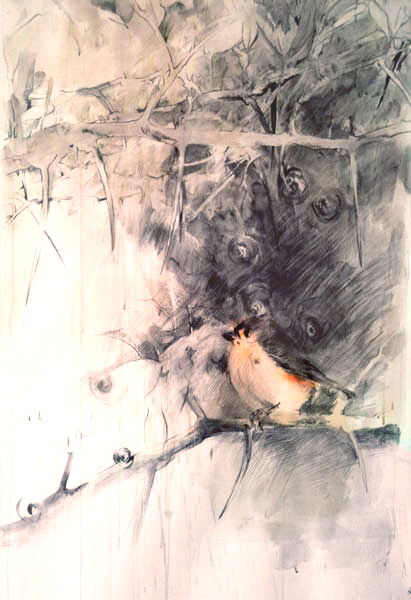 Since I was working on a 10 ft drawing that was going to need a bird known as a Tufted Titmouse, I figured I would try adding one of those to the composition. 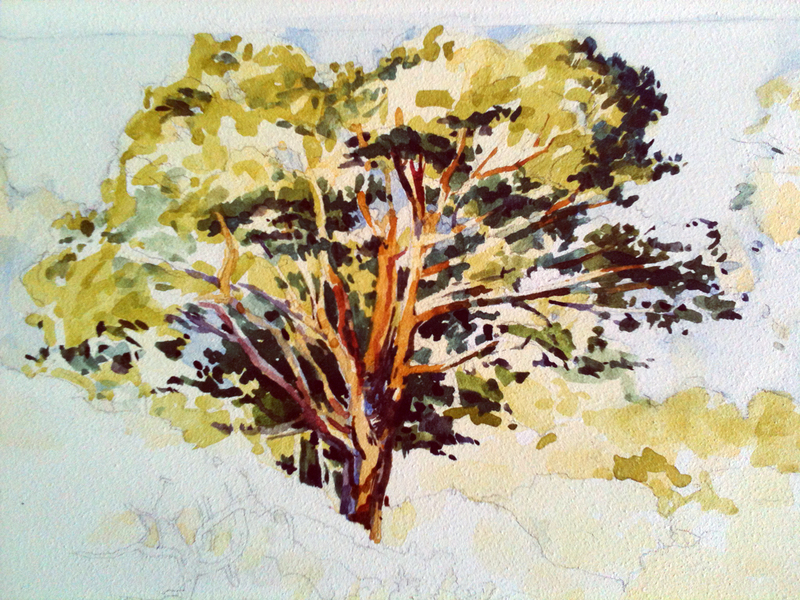 I had drawn some before … as studies for the larger work … but had not yet included one in a composition. So here was a chance to do so despite this piece being very different than the mylar one. Once I added the perched Tufted Titmouse work needed some more darks through the middle section. After working up the darks in the middle and some additional changes to the top register of the page, I backed off. I let a couple of days go by … looking from time to time while in the studio. After some small adjustments … I stopped “tinkering” and decided it was done. Now that it is complete, I realize that it isn’t really like either of the finished works it helped me prepare for anymore. That’s ok. The “study” went it’s own way and is now an independent work. I like it enough that I think that I’ll include it in my upcoming exhibit at Mary Baldwin College. Below this line of text there may be one of those (pesky or wonderful) adverts that WordPress sometimes attaches to help pay for its existence. We can’t blame them for wanting to survive! First, NO, I don’t have any tattoos of loons or anything else. No, I don’t want one either. But, in recent months I have sometimes posted about the art in my Natural-Family-History series. Those large drawings on mylar are created to give me a place to connect my ideas and reflections about family and place. The drawings are a sort of multi-voice dialogue between scientific and totemic, mimetic and poetic imagery. Sometimes I have been hard pressed to articulate what I am doing … or at least why. This blog (published by Muddy River Muse), at first seemingly unrelated, is on target; so on target because … better than anything I have written thus far … it hones in on a major part of what I am doing. Then there are Realists so enigmatic that their work creates all kinds of quandaries which rattle about in my head for a long time. Those are the Realists that I love most. In the States, I immediately think of the works of Andrew Wyeth or of Raphael Soyer. The former stretches credulity and design into a wonderfully complex matrix. Soyer, seemingly effortlessly, pushes you towards his subjects personal space … involving you, almost uncomfortably in their lives somehow. 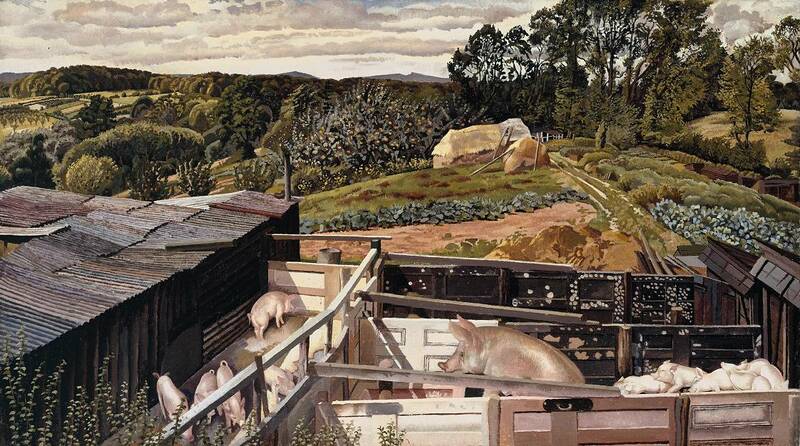 Spencer, as an artist who matured within sight of the first World War nearly a century ago, certainly had access to both the grand traditions of the past and the visual ideas of the new century at his disposal. He continually experimented with elements of both in his art. We can see in his drawing and painting that he had the training we would associate with that tradition. 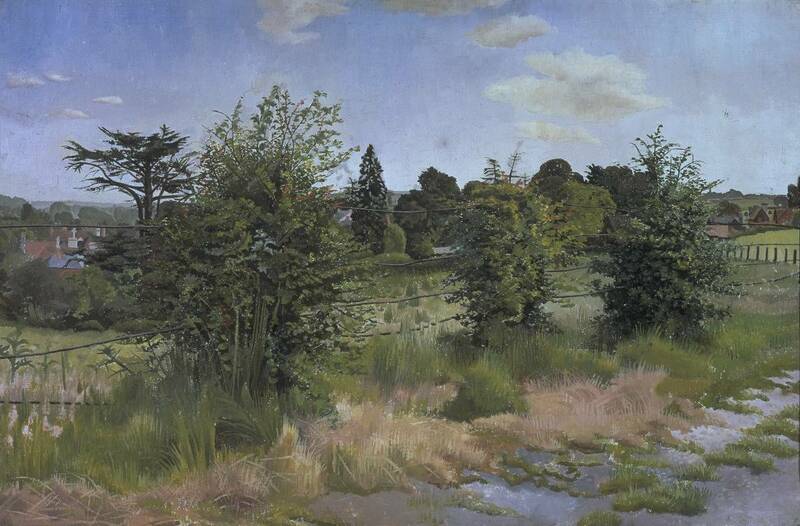 We also see in his work that he had an eye for composition that was not traditional … he crowded the viewers perception, pushed his subject into our world, dragged us into his equivocally desolate and lush visions. So to, in his life, he experimented and fumbled … ending up in a bit of a peculiar place when it came to relationships. That may have been why he lived so much of his life in and around the village of Cookham; midway between London and Oxford, a place where he could work out his own direction. In the end his work did not seek refuge in some safe and comfortable romanticism for days gone by. Neither did he unquestioningly embrace and advocate everything that was new. Instead, he engaged in the tumultuous negotiations between past and present, internal and external … that we all carry within us. You can see current events of his day in his work and timeless subjects. Not the same old take on those subjects … rather he looks upon them with a very personal perspective, and giving them a modern if sometimes quavering and enigmatic voice. Anything below this line may be an advertisement; even WordPress has to make a living. Sorry if it is for something that isn’t to your or my liking. Imperfect? A Leonardo drawing? Yes. Thankfully and beautifully, yes! You know, we humans often get it wrong. We work so hard at doing something perfectly. We assign so much prestige and even power to creating art that is “perfect!” Have you ever looked at a work (perhaps your own) and praised its mechanical, photographic precision? Or perhaps you remember bemoaning or besmirching a work that wasn’t precise enough to your eye? We praise the precision and ignore the perfectly wonderful. I have a surprise for you and all the folks who read this … Perfect is not spelled P-r-e-c-i-s-e.
Don’t get me wrong, I love precision … I have taught that it is a virtue to be sought after. In the right time and place, it can be gloriously beautiful. It can also be boringly mundane. Somehow the human hand, the human heart, the human mind creates beauty without being precise. Maybe a hint or a heaping helping of precision is there … sometimes none at all. But compelling images and beauty can find ways through with or without precision! Daumier was, for me at least, an acquired taste. But having acquired the taste, I am now addicted. I would liken it to the taste of dark chocolate or smell of grinding freshly roasted coffee. His line is so very descriptive; endlessly darting about the subject suggesting form and movement. Gesture drawing dominates the look of the drawn line; here and there alighting just for an instant to describe the physical reality we sense more than see. His drawing is so unlike some of the other masters of line from France around his time … excellent draughtsmen such as Ingres, Gerome, Prud’hon, and Degas. 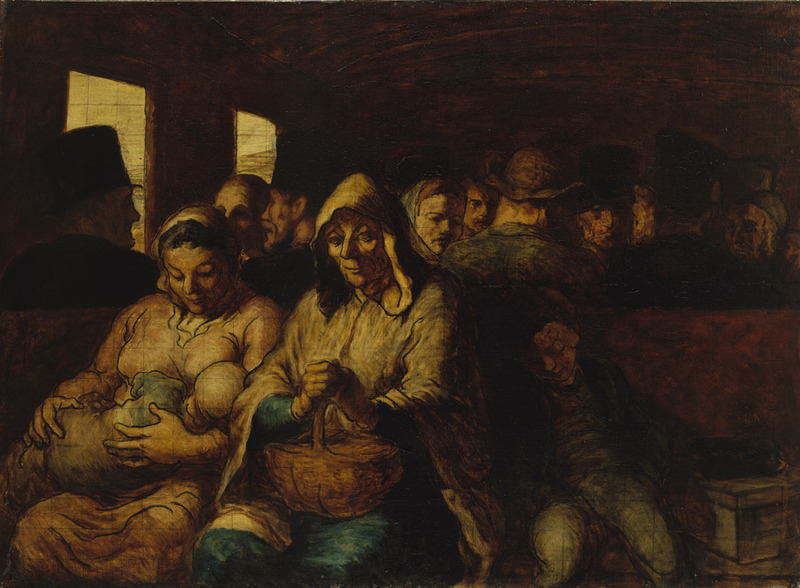 Daumier was part of the French wing of the Realist movement in the early 19th century. He worked pretty prolifically in painting and drawing. His work in wax sculpture is not as well known but is quite exciting if a bit enigmatic. What he is perhaps best known for is his drawings on lithographic stone for newspaper illustrations and political cartoons. I said that his drawing was different from his more well known contemporaries and near-contemporaries. So are his subjects. He depicts working class folks with generosity and compassion. He pokes a little fun at middle class folk when they seem pretentious. He really skewers the aristocrats and the arrogant wielders of cultural, political, and economic power mercilessly … especially so in his lithographic cartoons. More than once, he got himself into a bit of political trouble; especially so his famous print The Rue Transnonain from 1834 helped fuel political demonstrations and riots. Daumier was well respected then by his realist contemporaries like Courbet, many of his works were smaller, more intimately scaled … and often more intimate in their conception as well. Because of that, his work may have overlooked when displayed in the lavish Salons Exhibitions of the day. As an artist, I certainly like Daumier on many levels. I love his active use of line to describe form in movement. His pictorial design, while looking grounded in very 19th century concepts about picture making (at least to my eyes) has an immediacy and a rawness that presages much of the “in-your-face” strategies of contemporary work. There can be no denying that Daumier’s content isn’t compelling and forceful or intimate and nuanced by turns. But there is one subject in his work that I have to admit really gets my attention. It isn’t the thing he is most widely admired for either. To some, it may seem just a little to arcane, a little to precious a subject. selling prints, must have seen these folks regularly. He needed them. They where one of his major clientele. At times he makes fun of some for their snooty or dandified attitudes. A few look like terribly disengaged shoppers, as though they just don’t see anything they like at all. Others, he really captures their rapt attention or curiosity. Whatever he thinks of the individuals depicted amongst the displays and racks of prints, they almost always seem very human. I suspect Daumier was too. 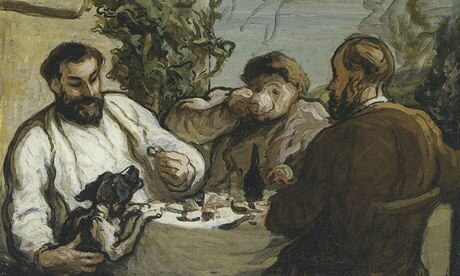 Well there is a new show of Daumier’s work that has just opened at Royal Academy in London. Apparently there are some art works that have not been seen outside of private collections in almost 200 years. If you would like a little more info about that show, I suggest taking a look at the blog listed below. If, on the other hand, you can’t make it to London and you want to see the most notorious print by Daumier you don’t have to go that far. 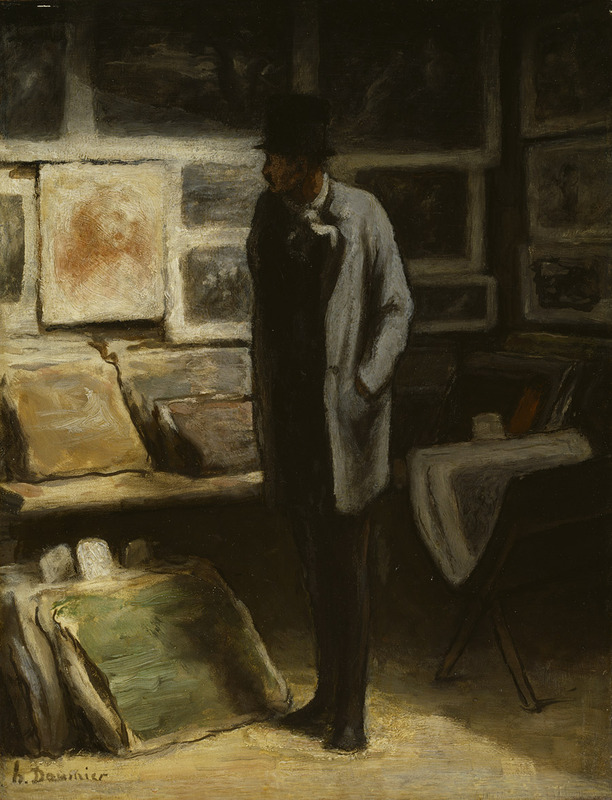 A wonderful example of Daumier’s Rue Transnonain (1934) is on display at the Metropolitan Museum of Art in NYC. Drawing Close and Being Transparent. Years ago, an artist friend, colleague, teacher, and mentor of mine, Clarence Morgan, noted that I really get excited about drawing. Today there is still real truth to that. The rush of emotions … joy, surprise, and elation at the sight of marks dancing across the page … just feels SO right, so rewarding. As I work through the stages of a drawing, when it is really going well, it almost seems that the image is forming itself. It is almost like “we” are intimate friends, even lovers, leaning in close, whispering … suggesting, teasing and coaxing each other where to go next. At other times, it is really much more like a wrestling match, as if the drawing and I are locked in a struggle. In that analogy, we are very close again … but this time pushing, pulling … working against each other in an attempt to get the “other” out of the way, out of some unseen box, across some unknown finish line. Frustration at the lack of understanding, cooperation, or completion. A contest of wills. You see, I tend to be the stubborn aesthetic arbiter; sometimes insisting on being in conscious control. Now that can be a problem … a big problem! 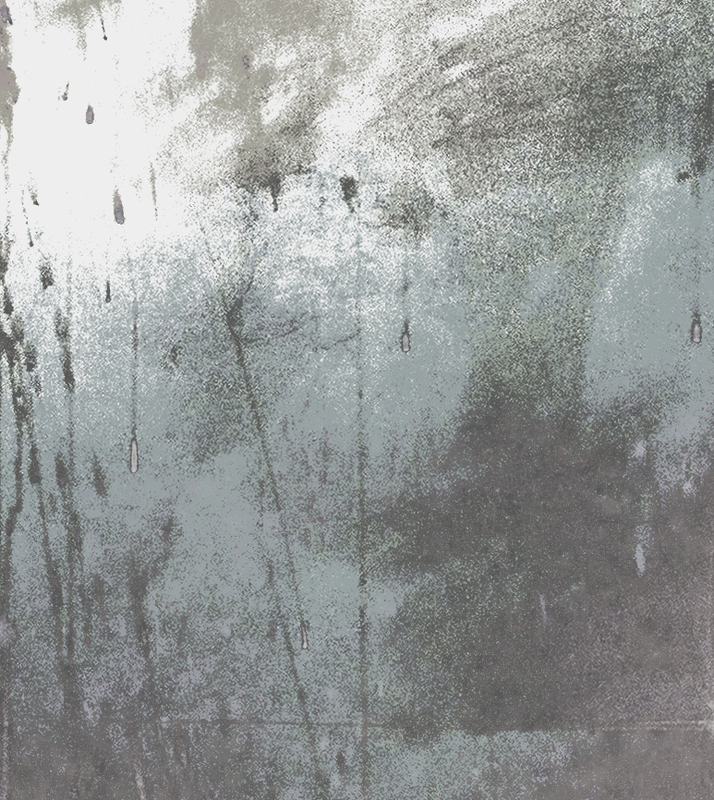 This image is part of one of my large mylar drawings. It is one of several pieces from my Natural-Family-History series that are in the studio right now. It has had moments of struggle as well as those quiet moments of intimate partnership. I hope it finds it’s way to a good, maybe even an ecstatic conclusion. Every once in a while it makes me think (feel … might actually be a better word here) as though my job as the artist is to become transparent (just like the Mylar I am drawing on!) and let the drawing come to life all on its own. Seeing may be a form of thinking (Arnheim). Even so, I know the physical act and the materiality of drawing isn’t thinking; but that doesn’t preclude that I want to understand something of the ideas, the wisdom, imbedded in the materials and the images themselves … wether they are my projections on them or something inherent within them. (Watch out there … I seem to be channeling the shades of Santayana and Aquinas both with that statement!) Nor does it mean that I will be immediately satisfied by the wisdom presented to me, pushed into my grasp by the drawing process. I will trying to bend it, somehow, closer to my will, to my thought … to an outcome that I had expected, that I want/wanted to accept. I may or may not get it all the way there. I could lose the contest. Just as often though … having to give in, letting the work have it’s own way … I am enlightened by the image, by the process, and/or the materials. I am transformed by the work/working as much as I have created the art work. Whether like lovers or wrestlers, in either case really exciting things can happen. As I said, Clarence noticed that I really get excited about drawing … at times even above and beyond my deep attachment to/involvement with painting. So, YES, Clarence was right. It is the balance of intimacy and power in the acts of drawing, whether in the small scale sketches or the larger works, that I love. Thanks for the insight old friend. Ok, you want to start a painting? There are lots of ways to begin … almost as many as there are artists out there. It helps to see some of the ways that artist have worked before. 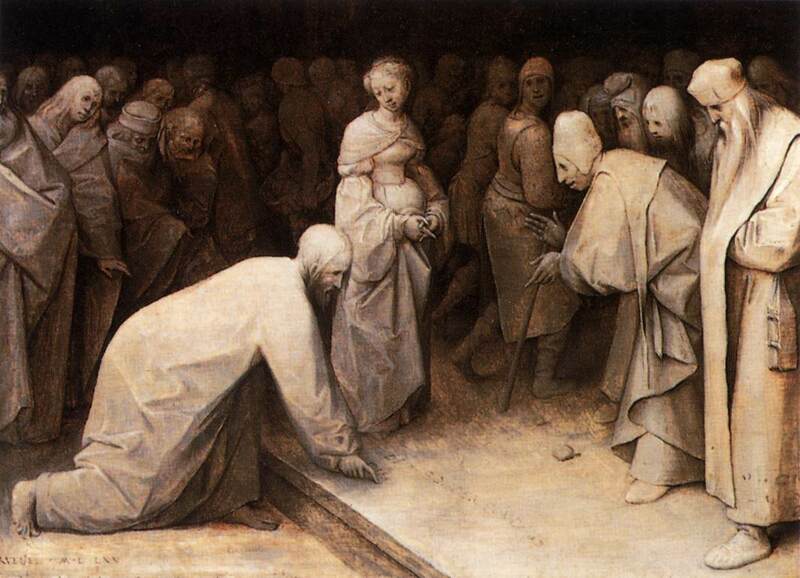 One way that was used in the Renaissance involves the use of a “underpainting.” The underpainting method used most often back then was to create a full fledged rendering of the image in value. 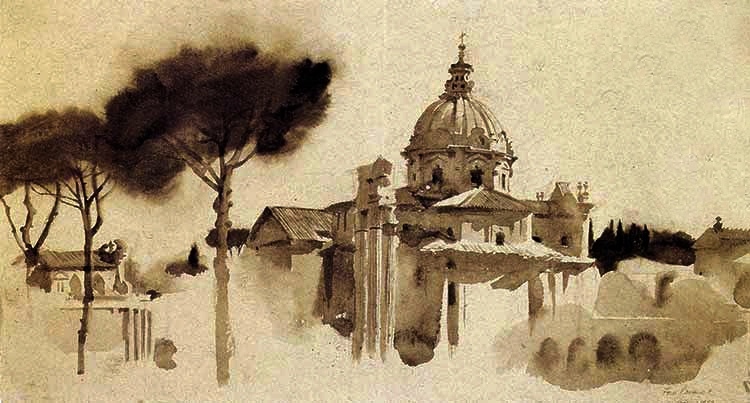 This technique, known as grisailles … creating a black, white, and grey painted image, was used to establish the image over which layers of color would be applied. Some of the upper layers of color might be opaque … but for the most part the new layers were translucent or even transparent. When opaque layers were used, the value of new upper layer was matched as closely as possible to the value established by the lower underpainting. While this method of underpainting fell out of favor (many early 19th C Realists and the Impressionists would complain that it was like painting on brown gravy), it never went away in art schools that favored what they term “traditional” art. 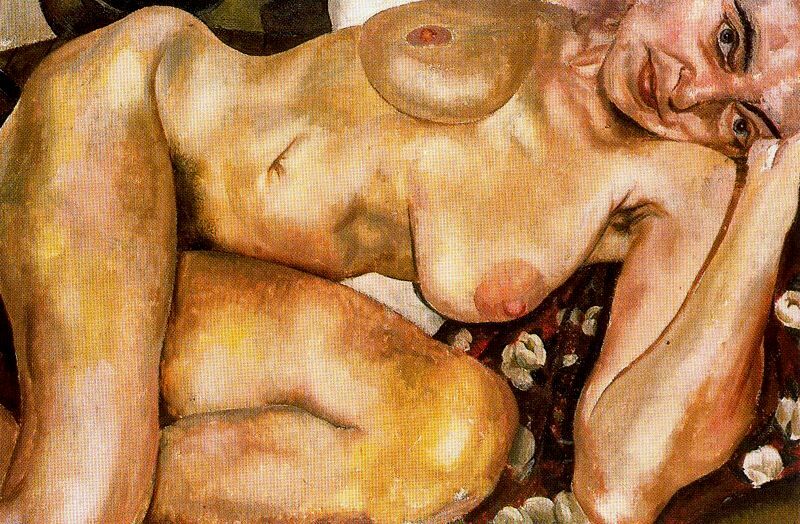 As artists have sought out ways to use the western figurative tradition (either as “traditionalists” or as Post-Modernists) this technique has had a resurgence in popularity. 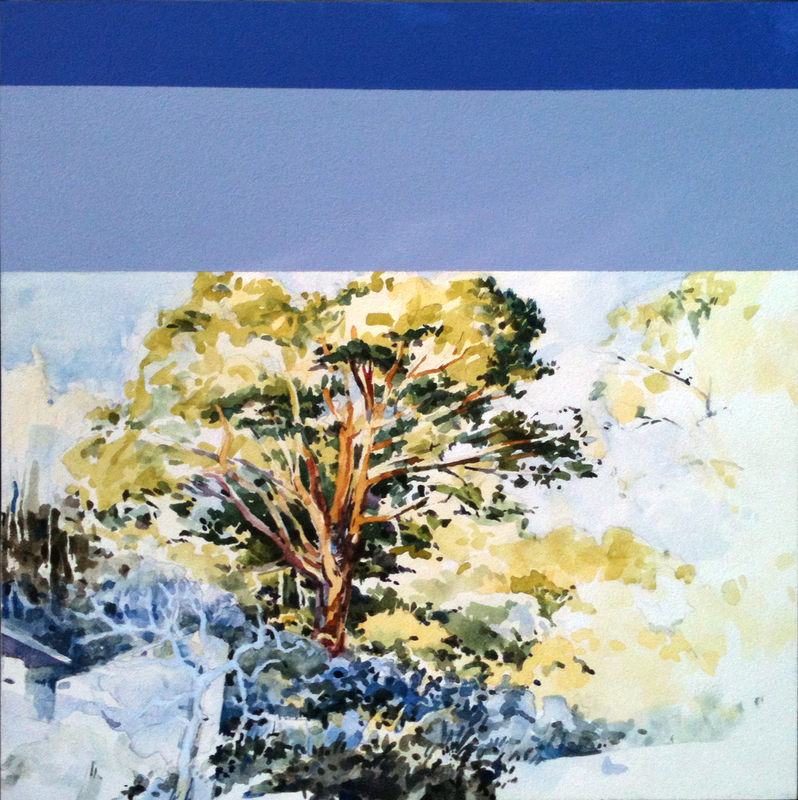 The example below is an “in-process” detail of a painting by the contemporary artist Joe Forkan. It is in fact a modernized re-working of not only this technique … but also a visual re-interpretation of Caravaggio’s Supper at Emmaus. 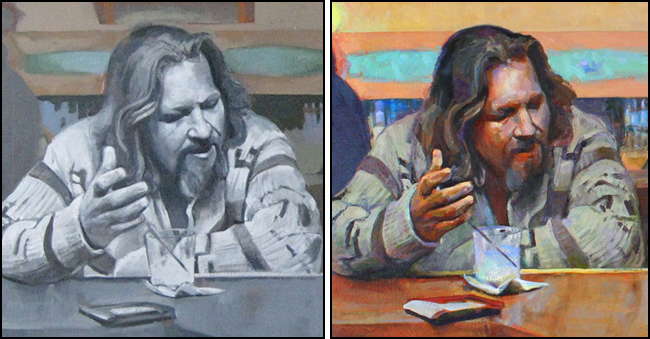 You can see the image on the left is mostly in grey and the image to the right has brighter, richer color added over the layer of underpainting. While a comeback for this method has been seen in recent years, many artists today, preferring a more direct and immediate technique, don’t use the full fledged grisailles underpainting technique. And unless we are lucky enough to see a demo of the process or happen upon one in a museum, art viewers seldom get to see what is under that imagery. There are other interesting underpainting traditions … and also quite a few direct painting techniques that do not use any under-painting at all! While my usual working methods fall into that latter category, I do enjoy the results my students get when we use grisailles for a while. Sometime soon I will show you a some other underpainting techniques used by a few of my artist friends. Duh, I make images. Sometimes though I make images that you could almost call objects; like my shaped panel painting. Most of the panel paintings are just that, paintings on panels. But the ones I bolt together into non-rectangular shapes might qualify even more as “object” than image. 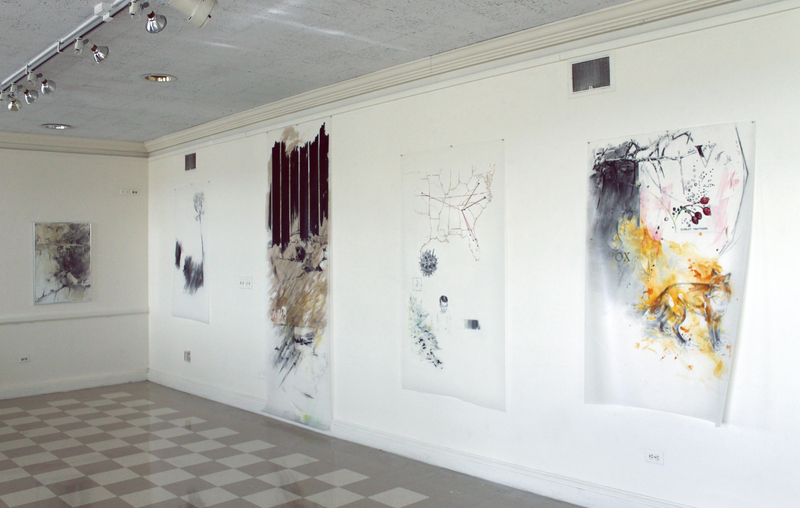 Other works that might be considered as “objects” are the larger of my mylar drawings. the ones that cascade off the wall or ceiling and onto the floor. But for many years, I worked on paper. Sometimes pretty big paper. I regularly worked on paper that was 40×60 or 30×90 or larger. Starting in the 1990s, I usually worked on paper sheets that were a bit smaller … measuring around 30×40. Well every now and then I return to that 30×40 way of working. I am not sure if I do it for comfort? … as a self-diversion? … or if there is a deeper reason? I just KNOW that sometimes I want to work on a single large uninterrupted sheet of paper. The expanse of the surface excites me; the response of wet color or dry mark to the paper entices me. More easily than any other medium, working on a beautiful sheet of paper with materials I enjoy, I become entranced. Reverie! 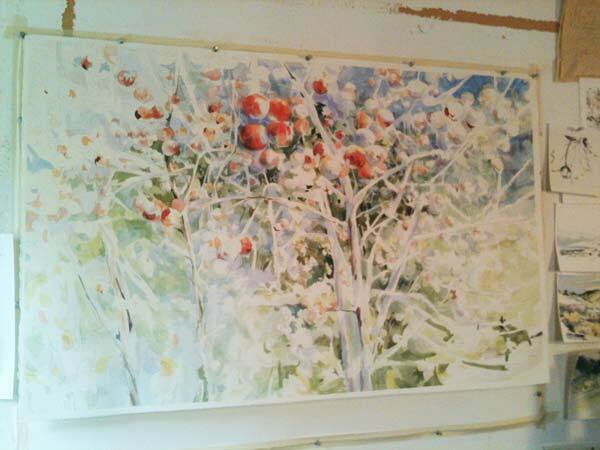 This piece, Abundance, had it’s genesis a while back, late in 2011 if I remember. It began on a crisp, cool clear day in a narrow glen of western-central Virginia, below a mountain ridge known for it’s ski resort … Wintergreen. 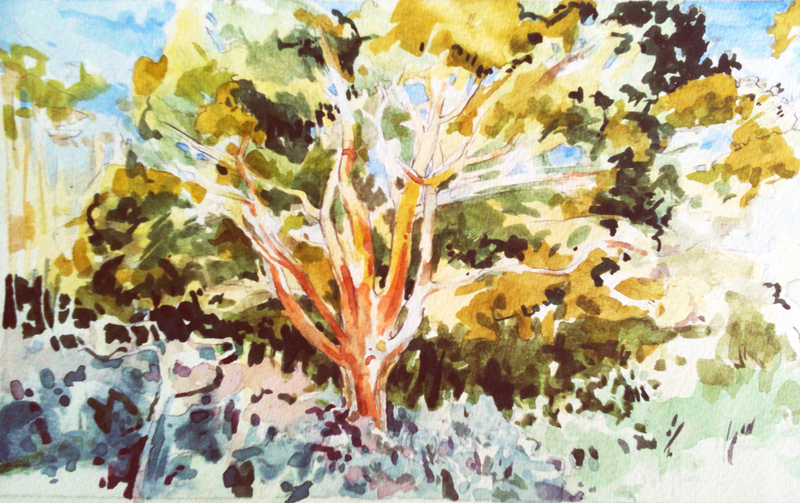 I was with my wife and “mi mum” and we had stopped for lunch when I spotted the wild looking group of bushes and a gnarled tree. The grey, nearly leafless bush was full of red berries. There were so many good vantage points with this subject. But … I was with family … so I made a quick sketch and several photographs. 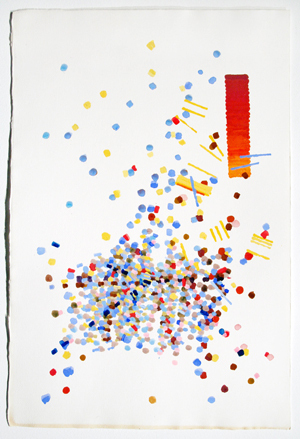 The little finished sketch was exhibited in a show during the fall of 2012. This larger painting I began while that show was still up. I even showed it, in a less finished state, in December and into January of this year. But, when it came back to the studio, I just wasn’t sure that it was done. I set it on a drawing board in my studio and I looked at it. I looked at it from January to June. Let me explain my quandary. I am frankly always leery of overworking a piece but I want to create a visual feast as well. I do subscribe to an esthetic common in traditional oriental painting … leaving white space in a work, going for an understatement. It is also at the core of early western classicist’s and early modernist’s desire to seek and to express what they view as the essential in an image/object. Probably that is why I am so very drawn to the works of Charles Demuth and Paul Cezanne. They made lots of marks and layers (visual feast) … but always seemed to leave room for the work to breathe, for the viewers eye to roam, and the viewers minds to complete the image (essence). To me, it seems rude and silly to beat the audience into submission by rendering every single detail. Even when I was young, the end results of demonstration artworks in “how-to” art books felt disappointingly over-done. (I usually liked the work at step #3 or #4 better than #6+) Well, with this one, I feel like if I take it much farther … it will be overworked. Can’t have that! For now, I have moved it to a less active corner of the studio. I will look at it for a while again; just like I did from January to June. Hopefully I will decide more quickly than that if I want to return and do something else with this piece. Yes, I do think it MIGHT be finished. What I am asking is … is it essential? … is it a feast for the eyes?